Which would you rather see under your deck? The deck ledger on the left (upper) is firmly attached with galvanized bolts; their large heads are clearly visible. The deck on the right (lower), however, is attached with only nails. Nails are thin, they can rust, and they easily pull out. Until several years ago, attaching a deck with just nails was legal in Massachusetts. Half the decks I see use only nails for support and are vulnerable. The good news here is that we can easily remedy this weakness by adding lag bolts – or better – by adding LedgerLok® screws to firmly fasten the ledger to your house. Here’s a video that shows you how. How safe are your deck footings? So the ledger supports half your deck, and the other half? Footings support the other half. Footings are those concrete bases, usually round, that support the deck columns at the ground. Each deck will have several footings that extend into the ground. The second major cause of deck failure is improper footings. Footings are often too small for a deck’s weight, and can sink into the ground and pull the deck down. And of course, footings fail only at the worst time – when loaded with your friends and family. Over the past 26 years, I have examined several thousand decks. One deck I saw a few years ago in Lexington, MA had some of the worst footings. More common than broken footings is undersized footings. Several factors are relevant here, but in general, 8” diameter footings are almost certainly too small for anything larger than a landing. If your deck footings are 10” in diameter, be wary. Footings 12” wide or wider are probably OK, depending on their number and location. Correcting inadequate footing problems is not easy. Just determining the extent of the problem requires analysis by a professional. And then enhancing your deck’s support, usually by adding more footings, columns, and supporting hardware, is labor-intensive, tricky work. Other deck problems can be much less obvious but still deadly. ♦ The frame of your deck (the structure underneath) should be made of pressure treated wood, because “PT” is guaranteed not to rot. If your deck was instead built with common pine or spruce or fir, it has a different guarantee — guaranteed that it will rot and then fall apart. Test your deck for rot by poking it with a screwdriver; it your tool sinks easily and deeply into the wood frame, then it’s rotting – and must be replaced. ♦ Decks with poor or totally absent flashing behind the deck ledger invite water that will rot your house. (Flashing is metal or rubber that directs water away from your house.) Unfortunately, this problem is subtle: flashing can be difficult to see and missing flashing is impossible to see. Here what you don’t see will hurt you. But look at the results: The deck here looked OK, but once we removed it, we found no flashing. 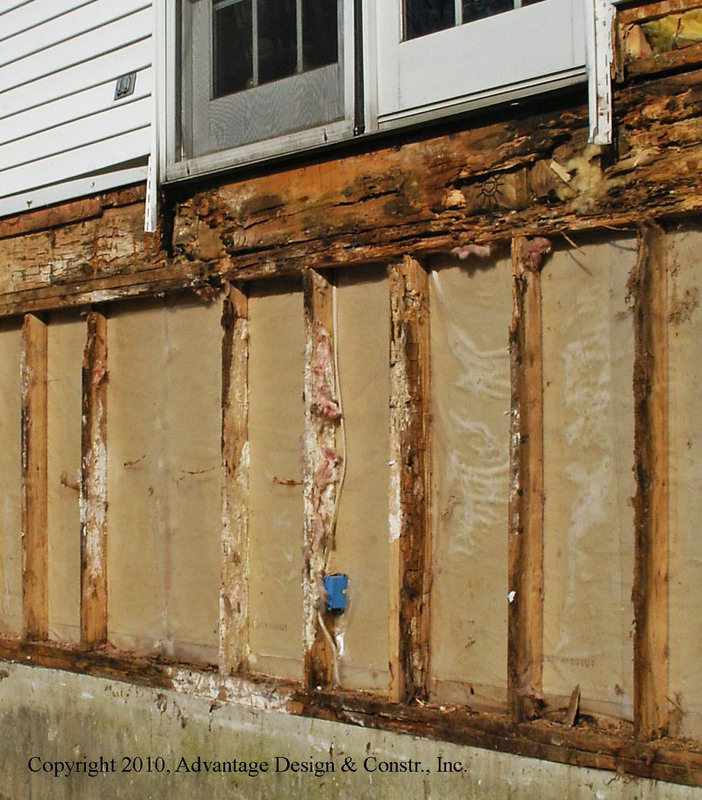 We removed the vinyl siding and looked further — and found that the house wall was rotting away. Over several years, water leaked in and rotted the sill, the band, the plywood sheathing, and even began to eat the wall studs below. A little longer, and the house wall would collapse. Notice that blue box in the photo? That’s an electrical outlet box. And the tan colored boards behind the rotting studs? That’s the back of the plaster board. ♦ Inadequately constructed rails can provide the illusion of safety, but betray you when you need them most. Push on them vigorously. If your rails wobble, they are dangerous. ♦ And stairs…Wow, stairs can fail in many ways, for many reasons. Inadequate fasteners (nails), too few stringers (those large, saw-tooth shaped supports under the steps), poorly cut stringers, missing or shaky stair rails, no concrete pad at the bottom, etc. Stairs can be scary. So how does your deck measure up? Is it safe? Look carefully at your deck before you host that big party this summer. If it shows some dangerous signs or if you’re not sure, call a deck expert. Our office in Burlington, MA performs detailed safety inspections in our area at a very modest cost. Call or e-mail us at subboston@archadeck.net. We at Advantage Design & Construction offer professional design and build services for clients west and north of Boston. Over the past 26 years we have designed and built over 950 projects. We have enhanced the depth of our expertise by limiting our work to decks, porches, sunrooms, and patios. To view some of these projects, visit our website. To learn how we treat our clients, check us on Angie’s List or read a recent article about us in Remodeling Magazine. For a free design consultation and a relaxed and rewarding design and construction experience, contact us via e-mail, subboston@archadeck.net or by phone, 781-273-3500. © 2010, 2016 Advantage Design & Construction, Inc.
Wow. This was very informative. I happened to be washing my deck this weekend and noticed for the first time that one of the wood support posts was just slightly resting on the concrete footing. I could actually wiggle the post a bit. I’m not very familiar with construction so is this a problem?Isn’t the post supposed to go into the concrete???? If so, can this be fixed? 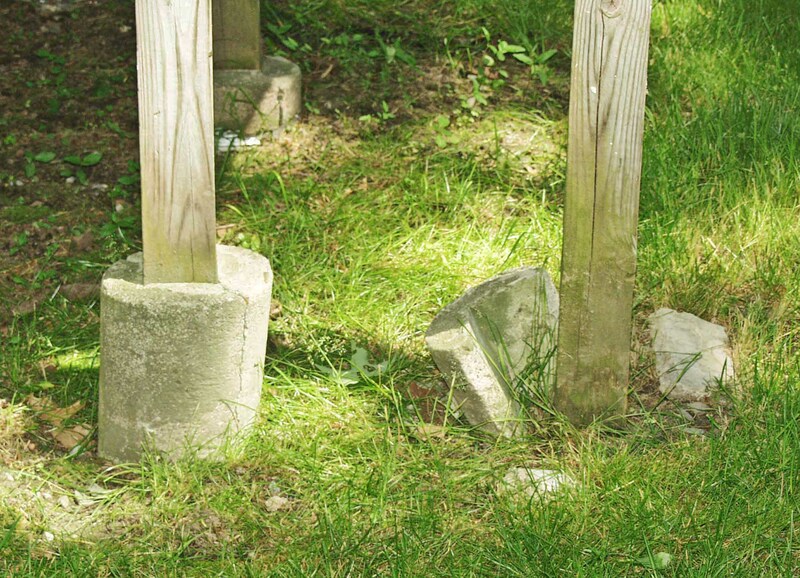 Yes, wood support columns should not be loose and should be firmly attached to the concrete footings that support them. The best fastener is a “post anchor” — a galvanized metal bracket that is nailed (on 4 sides) to the column and bolted into the concrete. Actually, new pressure treated wood should not be inserted into wet concrete. The concrete hardens around the wood column and this initially looks good. But over time, the PT will shrink (across the grain) and create a gap for water, which freezes, expands and can split off the concrete. This is most likely the cause of the broken footing you saw in my blog. Back to your problem, Faith. The loose (or absent) connection between the deck support column and its concrete footing could be dangerous. The urgency here depends on how high your deck is and how unstable the column is. Have an expert look at it — a deck builder or your town building inspector.